A prison built by the British on an archaeological site in northern Israel in the 1940s is finally going to be evacuated. 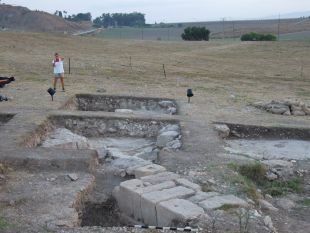 The walls and barbed wire of Megiddo Prison will be replaced with an archaeological park featuring one of the earliest-known houses of Christian worship, which was found in the ancient Jewish village of Kefar Othnay (a.k.a. Kfar Otnai), as well as the remains of a vast Roman army base across the Qeni river, Megiddo Regional Council announced this week. 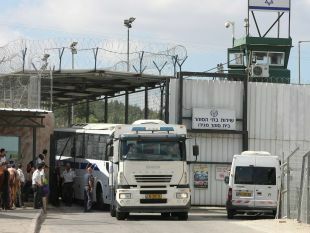 Thanks to Israel adopting European standards for minimum space per inmate, the Megiddo inmates will be moving to a new, improved facility, as will the people incarcerated in three other Israeli jails that also fail to comply with the new standards, Megiddo Regional Council spokeswoman Yael Barnir told Haaretz on Wednesday. The authorities controlling British Mandatory Palestine until 1948 knew perfectly well they were erecting Megiddo Prison on a historic site, Dr. Yotam Tepper of the University of Haifa tells Haaretz. Upon Israel’s independence, control of the prison passed from the British to the Israeli army, and later to the Israel Prison Service. 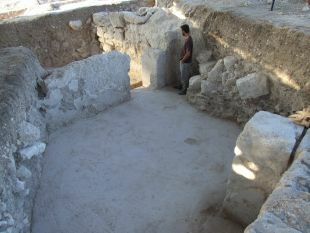 The salvage excavation, following earlier surveys and conducted from 2003 by Tepper (then affiliated with Tel Aviv University) and the Israel Antiquities Authority – identified ruins in the prison grounds as the Jewish and Samaritan village of Othnay, mentioned in Jewish sources as existing from the first to the fourth centuries, and a large structure that seems to have been a pre-church house of Christian worship, as well as unexpected clues about the complicated nature of early Christianity. Such as, maybe the Roman army wasn’t entirely negative about the upstart religion after all. 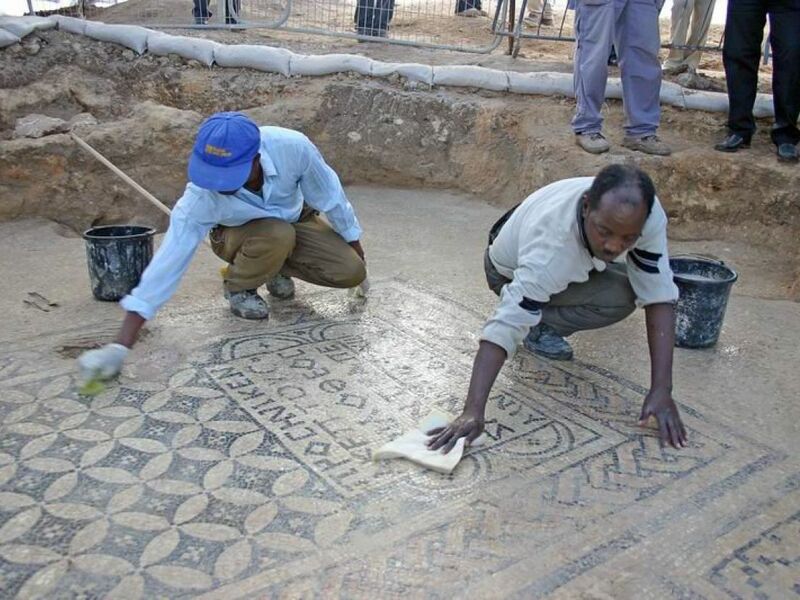 Some of the most extraordinary finds within the Megiddo Prison grounds were made by prisoners, excavating from 2003 to 2008 under the auspices of the Antiquities Authority and Tepper. It was an inmate who in 2005 uncovered a well-preserved mosaic, 54 square meters in size, that had an extraordinary message to convey. 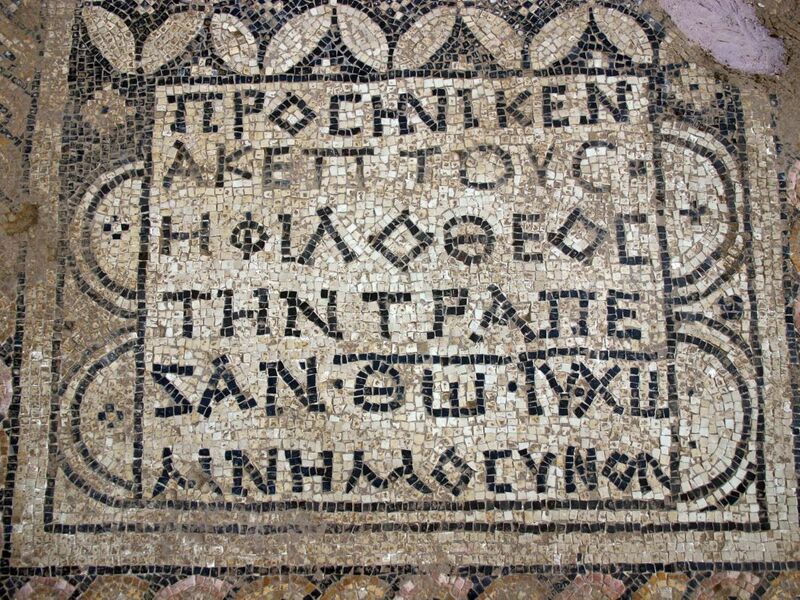 Dated to the year 230, very early in the Christian era, the mosaic bears three inscriptions in ancient Greek – one explicitly calling Jesus a deity. “The god-loving Akeptous has offered the table to God Jesus Christ as a memorial,” the writing says, in black tesserae letters 7.5 to 9 centimeters in height. Akeptous is believed to be the name of a woman who paid for a communion table that probably served for the Eucharist ceremony. 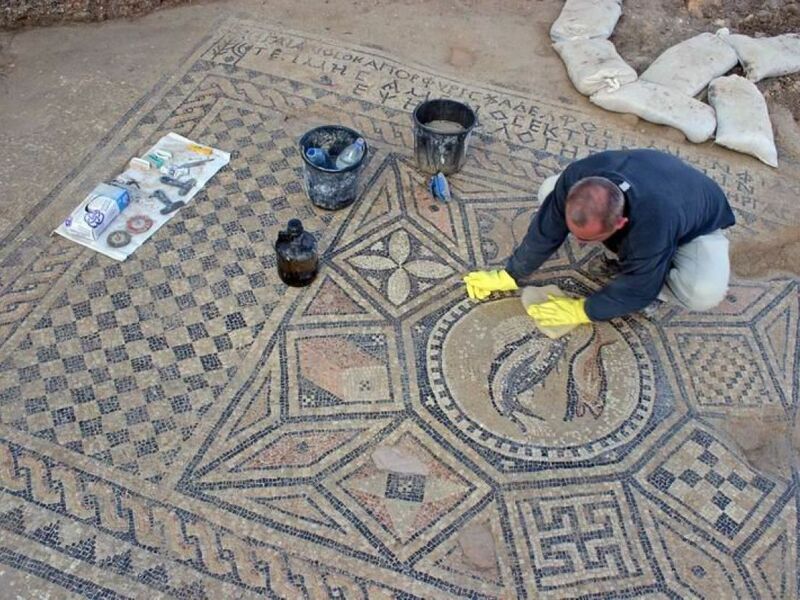 The mosaic floor was inside a large building about 30 meters by 40 meters in area that seems to have been residential, not a classic church or basilica, Tepper says. Churches didn’t exist in the third century. But Christianity had begun to take form, and while Romans seem to have lived in some of the house’s rooms, the one with the mosaic would probably have been a prayer hall. 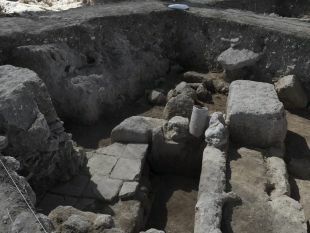 There are other similar examples of houses in the region that scholars call domus ecclesiae – houses that archaeologists believe have areas devoted to prayer. One is the so-called House of Peter in nearby Capernaum, a ruin found underneath an ancient church that seems to have been repurposed as a gathering place after the time of Jesus’ death. The structure of the Othnay building was typical of a Middle Eastern home of the time, with courtyards, Tepper says. It also had however a tiled roof akin to the domiciles in the Roman camp next door, where the archaeologists found tiles marked with the Legion stamp. The Jewish homes didn't have such tiled roofs, he notes. It would only be a century after this Othnay prayer house was built that the Holy Roman Emperor Constantine would himself embrace Christianity, cynically or otherwise, and the Roman army and empire would convert to the new religion. Then churches per se started to appear. Meanwhile, the very earliest Christians would gather and dine together: Note the tradition of the Last Supper, Tepper points out. Possibly this structure in Othnay served for such gatherings in the pre-Byzantine Holy Land. 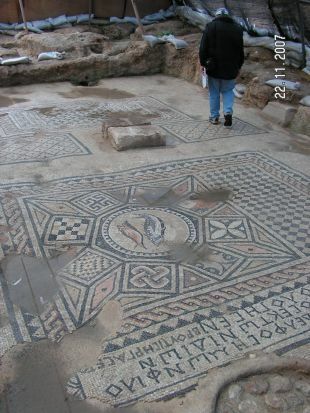 The mosaic also features fish, which are considered a symbol of early Christianity. And the mosaic may point to another thing entirely: That the world has misunderstood the complexity of the Roman attitude to nascent Christianity. The revelation involves Legio, across the river from Megiddo Prison, where archaeologists found the biggest Roman encampment outside Jerusalem (which the Romans had destroyed in 70, rebuilt, and renamed Aelia Capitolina). Now cultivated fields, it had been the base of the Legio VI Ferrata, or Sixth Legion Ironclads, with around 5,000 soldiers – a vast number. It is also where, in 2017, archaeologists found the cremated remains of a soldier in a pottery cooking pot. This was not evidence of cannibalism, but a habitual form of “burial” in Roman military circles. 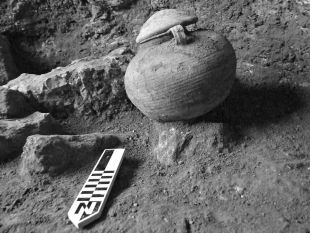 Moving on from the cookware-interred soldier, “We think some of the Roman soldiers at Legio were Christian,” Tepper avers, and most importantly, they weren't in hiding. Nor was the Christian prayer house in Othnay scaled down or concealed. The evidence is that the name of the mosaic donor appears to be that of a Roman centurion: Gaianus, who was also called “Porophrius, our brother." All this contravenes the conventional wisdom that Rome imposed blanket hostility on early Christianity. The period when this house of worship was used was a time of decline for the Roman Empire, and Christianity was supposed to have been banned. Possibly, early Christians were persecuted just as history tells, in Asia Minor, but not in Israel. Many Roman officers serving in the Ironclads would have been pagan, worshipping Jupiter or the caesar or whoever. Others were Christians and some lived with their families in Kefar Othnay, probably on the outskirts of the village, Tepper says. 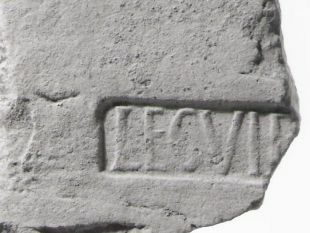 Among the archaeological evidence for Romans residing in the town, not only in camp, are bits of spears and other weaponry, stamps of two breadmakers who fed the Ferrata, and more. 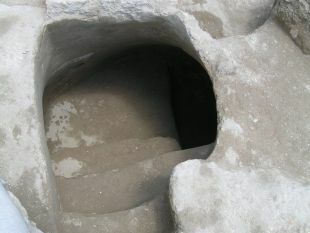 Kefar Othnay was identified in the prison grounds – just across the stream, a few hundred meters from the Ironclads’ camp – based on the discovery of ritual baths (mikvehs), stone tableware that is permissible for Jews to use under the laws of kashrut, and artifacts. Tepper speculates that the village residents sold stuff to the hordes of Roman soldiers next door during the second and third centuries. Following Constantine’s conversion, whole Roman legions would kneel and accept Christianity. 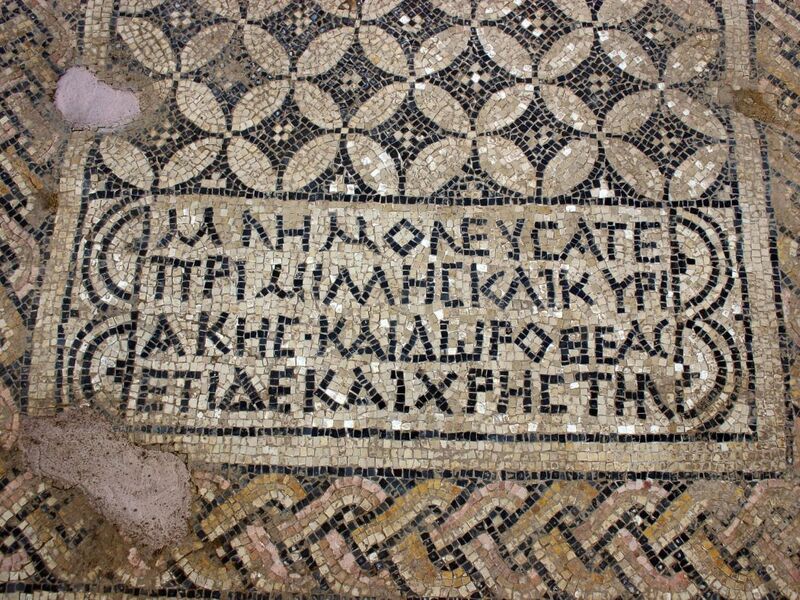 But as we said, that was a century after somebody bought a beautiful mosaic for the floor of the early Christian house of worship in Othnay. Right nearby are ruins identified as the Byzantine city of Maximianopolis, founded in the fourth century, which would morph into Lajjun under the Islamic era. And soon tourists will be able to visit and see all this for themselves.